The third and final image from my BART commute this cold and rainy morning: Reflections in the window of the BART/CalTrain station in Millbrae, CA. 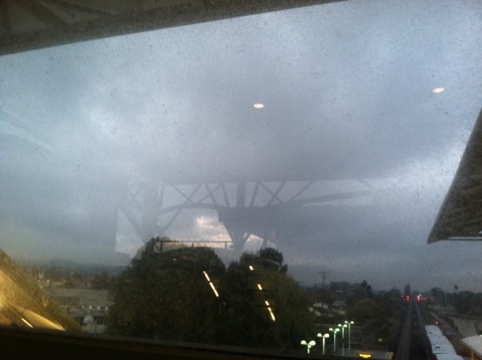 Below, the CalTrain tracks and a northbound train; in the reflection, the canopy roof of the train station. The light of the rising sun on the clouds in the reflection adds a bright spot to the gray sky. This entry was posted in GAY GAZE: Visual Culture, Photos, Art, Comics, Film, Objects, etc..., iPhone, Northern California, Photography, Travel and tagged BART, CalTrain, commute, Millbrae, reflection, reflections, station, train, Travel. Bookmark the permalink.